The photovoltaic solar power sector first emerged at the beginning of the last decade as a technology for producing clean energy that was in its infancy, but which had enormous potential for helping to attain the objectives set out in the Kyoto protocol for reducing the greenhouse gas emissions that trigger global warming. The pursuit of these objectives led many European countries to significantly increase their production and consumption of renewable energies, where they led the growth of the photovoltaic sector with the help of the specific regulations that established attractive premiums for developing this kind of energy, mainly in Germany, Spain and Italy. 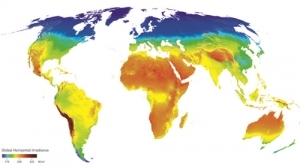 These favourable conditions also drove rapid growth of the photovoltaic industry world-wide. In under 10 years, the advances in photo-voltaic technology have led to significant cost reductions and a notable increase in its reliability. This has increased its potential to become not only a leading renewable energy, but also an alternative source of energy generation internationally. That is why photovoltaic solar energy has embarked on a new phase of expansion throughout the world over the last ten years, especially in countries with high energy consumption and in countries in which the demand for photo-voltaic energy has increased or is expected to increase in the short term, in search of “grid parity” (countries with high levels of solar radiation and high electricity prices). 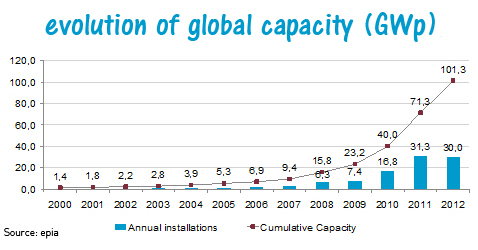 Photovoltaic capacity grew to 100 GWp in 2012, generating growth of over 30 GWp for the second year in a row. Europe concentrates most of this power, with 69 GWp, and generates around 2.6% of the electricity consumed, with over 50% of the global photovoltaic market concentrated in Germany, Italy and Spain. The photovoltaic market in the rest of the world has a capacity of 31GWp, representing an insignificant percentage of the electricity consumed, although it has made significant progress with rapid development over the last three years (13 GWp in 2012, 7.7 GWp in 2011 and 3 GWp in 2010). This market is led by China, the United States and Japan, with 8.5GW of rated power in these countries in 2012. Beyond its progress in what we call the “first world” however, photovoltaic solar-power technology is an excellent opportunity to improve the living conditions of millions of people who currently have no access to electricity, as it is so easy to roll out anywhere. According to a recent report from the World Bank and the International Energy Agency (IEA), there are still more than 1.2 bn people in the world without access to electricity, mainly in rural areas of Asia, Sub-Saharan Africa and Central America.